“I can’t stop thinking” and “I can’t turn off my thoughts” are common experiences reported during the early days of grief. This is normal. The first step in managing ruminations, fears, worries and other discursive thoughts associated with grief is to understand that you are not your thoughts. Troubling thoughts can place us in a virtual time machine. Most of us will either relive the past or scoot off to the future as though we know what will happen next. There are many ways to mindfully explore your thoughts in the present moment, so you can decide if they are worthy of your attention or not. You can train your mind to be in the present moment with equanimity—a sense of calm and balance—even when the content is challenging. Meditation can help. Focusing techniques, such as counting your breath or repeating a mantra, will help you take a break from unpleasant thoughts and give your mind a place to rest. The side effects include increased concentration and an improved sense of well-being. The point of meditation is not to get rid of your thoughts, but to transform how you relate to your thoughts. This transformation, in turn, will help your body feel better so you can cope with grief and your life after loss. A grief journal will help you in many ways. You can use it to have a conversation with your departed loved one, sharing thoughts and feelings that you did not get to share when they were alive. Your journal is also a place to unload thoughts and feelings you no longer wish to carry around. As you put pen to paper, or fingers to keyboard, try to imagine you are physically moving your burdens from inside to outside your body. A grief journal can also help you record your thoughts for later reflection, rework your post-loss narrative, and receive surprising insights and guidance. Many people who keep grief journals report feeling a sense of relief when they are able to let go of the “inner critic” and write from the heart. As your words flow on the page, chances are you will shift from “thinking mind” to “feeling mind,” and powerful insights may arise. 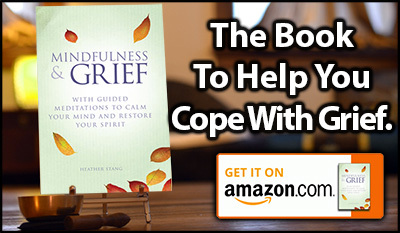 There are many ways to keep the grief journal, including both online and off. If you feel stuck, writing prompts can help, or you can try taking a walk, exercising, or meditating before writing down your thoughts in your grief journal. This practice will give you power over your mind, rather than the other way around.